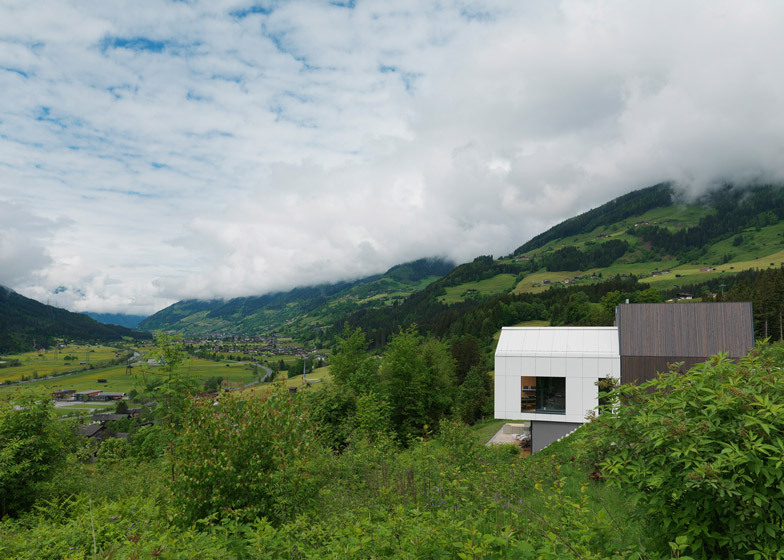 Two house-shaped rooms project out from the facade of this three-storey residence by SoNo Arhitekti, which nestles into a hillside near an Austrian Alpine village (+ slideshow). 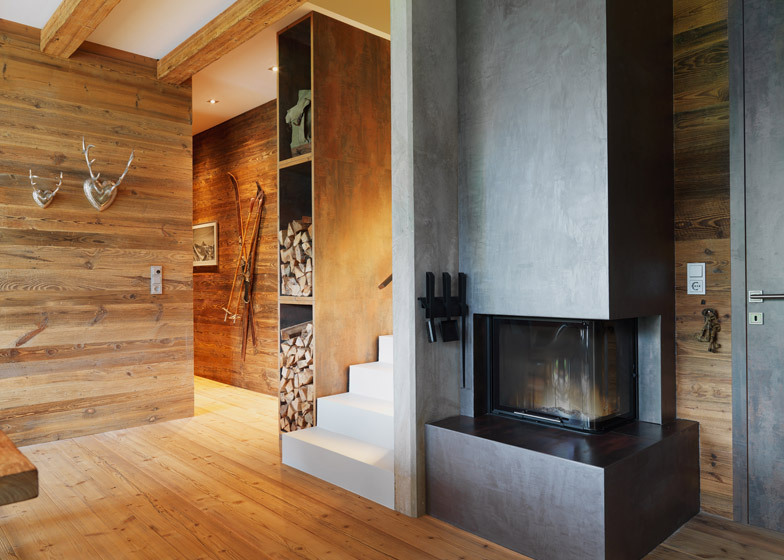 Named Mountain View House, the family residence is located in close vicinity to the Kitzbuehel skiing resort. 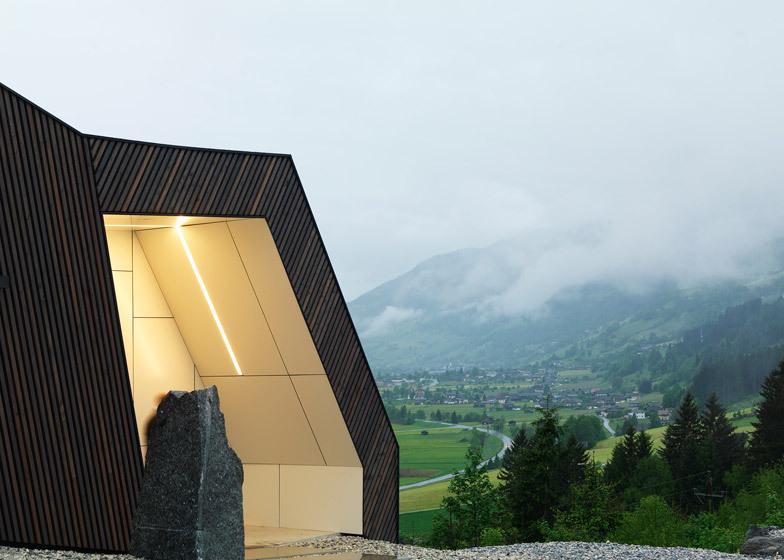 Its position near the top of the hill allows for impressive views, so the house was designed to take advantage of this. 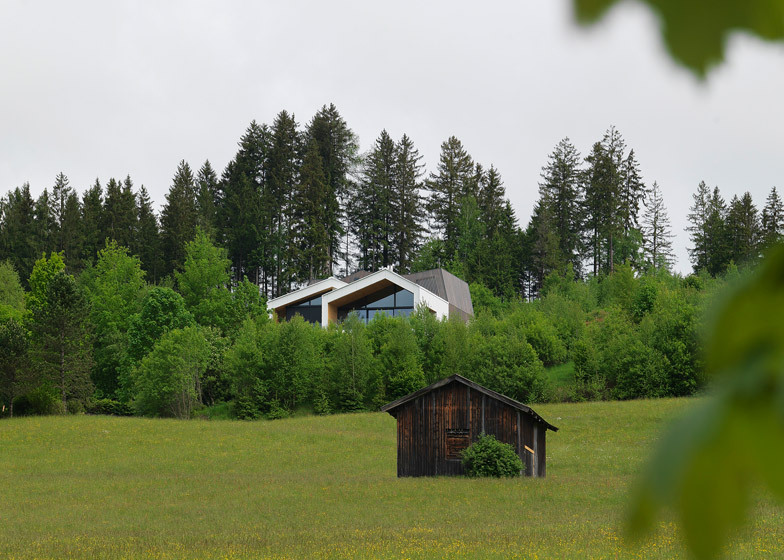 Slovenian studio SoNo Arhitekti conceived the building as a cluster of smaller volumes – some that mimic the shapes of traditional Alpine cabins and some that are more contemporary in form. 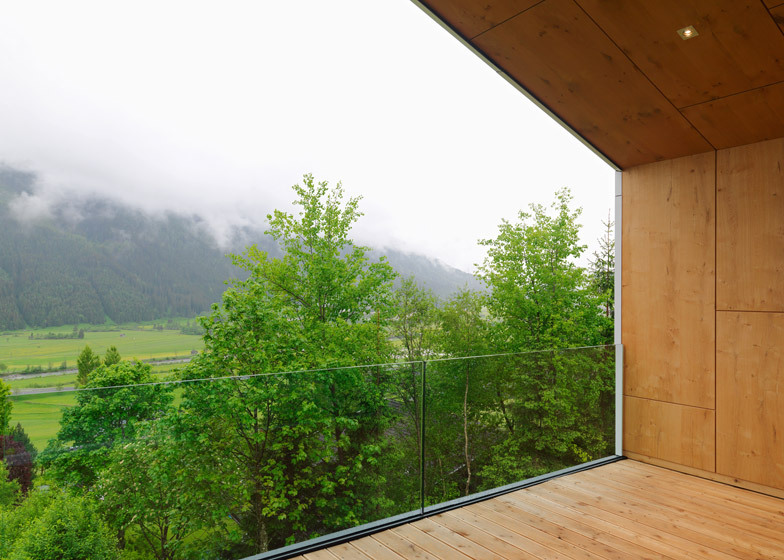 This arrangement made it easy to create entire walls of glazing in front of some of the rooms, offering residents panoramic views. 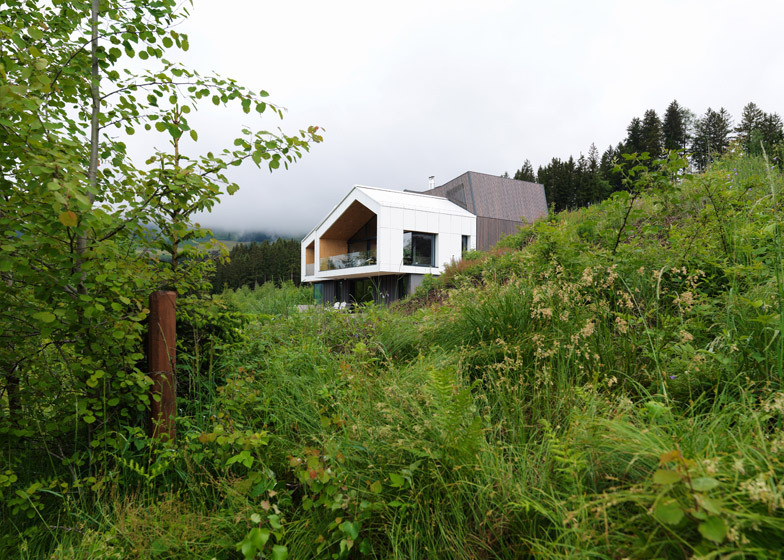 "The residence takes different shapes depending on the viewer's standpoint, due to the playful design of the gable roofs that echo the shape of nearby mountain peaks," said the architects. "Inside the living spaces and the master bedroom it feels like you're floating out into the distant landscape. The lowest level is more grounded and darker, but still followed with spectacular views." The house is framed by reinforced concrete and cross-laminated timber. "This allowed us to have a very spacious design without having additional columns and beams," the architects told Dezeen. 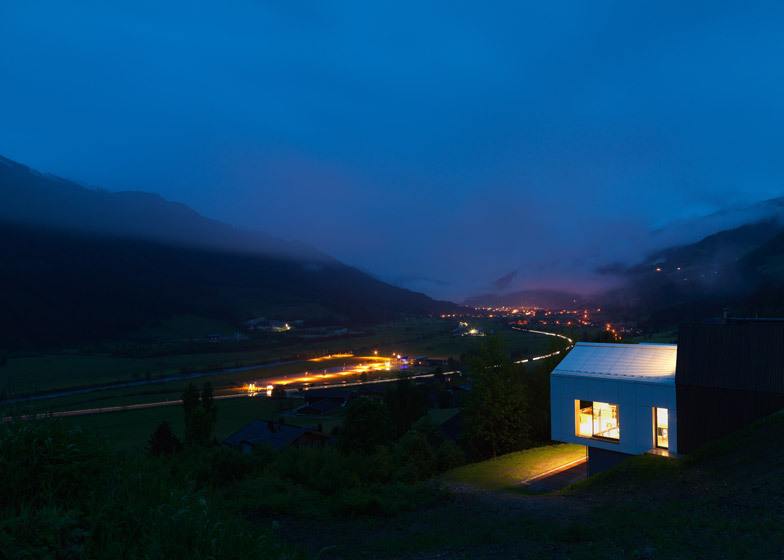 Externally, the two projecting house-shaped volumes are clad with prefabricated white cement panels. This allows them to stand out from the other walls of the building, which are either clad with timber slats or left as exposed concrete. Due to the steep slope of the hillside, the house's entrance is located on the uppermost floor, along with the parking garage. Once inside, residents are directed towards a grand living space on the middle floor. An angular window is positioned in front of the window, while boxy bookshelves form a see-through partition between the staircase and a corridor on the right-hand side. The large living space, which has a lounge on one side and a dining area and kitchen on the other, forms the largest of the two house-shaped blocks. Its entire front wall is glazed and opens out to a generous balcony. The other volume is located on the opposite side of this floor and accommodates the master bedroom suite. It also opens out to a balcony, which wraps around the corner of the building to create some privacy. 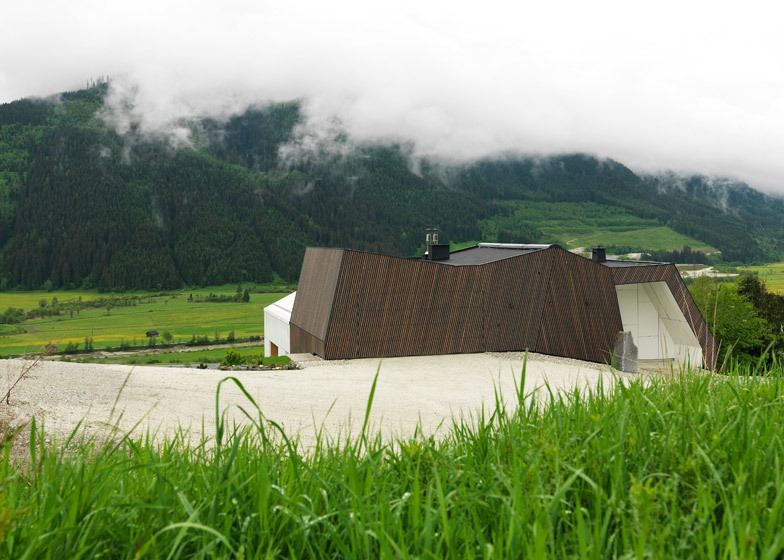 "All in all, the house is planned so that is hidden away from neighbouring eyes and open only to the landscape or the sky," said SoNo Arhitekti. Some of the walls on this level have been painted white but there are also various concrete surfaces, as well as wooden walls and floors. But wooden surfaces dominate on the basement level below. "Interiors are modern, full of natural light and natural colours, with different combinations of materials that develop a warm welcoming atmosphere," added the team. 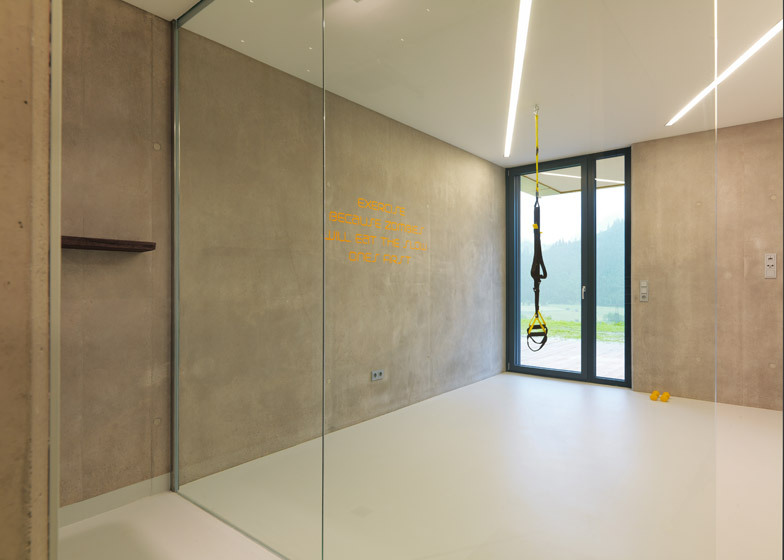 Rooms on the lower level include a celebration area – known as a zilberstube – as well as guest bedrooms, a fitness room and a wine cellar. Many of these rooms also open out to a hillside terrace. Photography is by Matevž Paternoster.